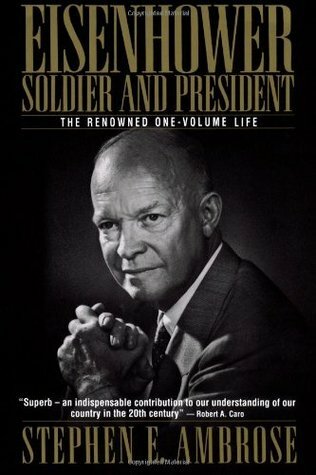 Six years after completing his two-volume biography of Dwight Eisenhower, Stephen Ambrose authored an abridgement of the series: “Eisenhower: Soldier and President (The Renowned One-Volume Life).” Ambrose was an author and historian whose legacy has been seriously tainted by numerous and often convincing allegations of plagiarism and exaggeration. Ambrose died in 2002 at the age of sixty-six. Published in 1990, this biography quickly became the “standard” on Eisenhower for non-historians and remains one of the most popular comprehensive treatments of Eisenhower’s life. With 576 pages of text, it is just under half the size of the series but packs nearly as much punch – and with far greater efficiency. But it is not merely a condensation of the original series; in many areas it has been updated and refreshed. Like the series from which it was derived, this biography is surprisingly objective given the author’s well-known fondness for his subject. While Ambrose is quick to praise Eisenhower for his successes, he is equally rapid in pointing out shortcomings and failures. In fact, Ambrose is at his best when critiquing Eisenhower for his failure to directly challenge Joe McCarthy, for his failure to enthusiastically support civil right advances and for his failure to more enthusiastically endorse Nixon for president. But for many readers (particularly those somewhat familiar with Eisenhower) the best part of this biography is Ambrose’s assessment of Eisenhower’s legacy and his review of Ike’s post-presidency. Not only is the author’s appraisal of Eisenhower’s presidency thoughtful and balanced, but his review of Eisenhower’s interactions with his successors (Kennedy and LBJ, in particular) is both interesting and revealing. Unfortunately for readers interested in understanding the genesis of Eisenhower’s character, however, Ambrose’s biography proves weak on its subject’s early life. After just fifty pages Eisenhower is already fifty-one years old and a senior Army officer. Most of his formative moments are touched upon…but not with the depth required to paint a fully revealing portrait of Ike. By comparison, Jean Edward Smith’s biography takes three times more space – and D’Este’s nearly six times – to cover the same span of Eisenhower’s life. Readers will also find that, like the underlying series, this single-volume biography of Eisenhower lacks the fluidity and vibrancy of more engaging narratives. Ambrose’s style is straightforward and matter-of-fact rather than embracing and captivating; it is reminiscent of a history professor rather than a great storyteller. But unlike the series, and to its credit, this biography does not frequently wander into seemingly gratuitous detail and avoids long, tedious stretches. Overall, Stephen Ambrose’s “Eisenhower: Soldier and President” proves a rare case where a series abridgement is worth more than the sum of its parts. All but the most committed student of Eisenhower is likely to prefer this biography to the far more detailed two-volume series. But where Ambrose’s was once arguably the preeminent biographer of Eisenhower, both his series and this even better abridgement have been surpassed by more recent, engaging and colorful accounts of Eisenhower’s life. * I have rated this biography without regard to allegations of plagiarism by Ambrose (which are generally directed toward his other books), allegations he greatly exaggerated the number of interviews he conducted with Eisenhower in the preparation of this series and allegations he fabricated at least one significant quote by Eisenhower. Do you plan to read/review Ike’s Bluff, by Evan Thomas or Three Days in January by Bret Baier? I read “Ike’s Bluff” a few weeks ago (review here) and liked it. I will probably add Bret Baier’s book to my follow-up list; have you read that one and, if so, what did you think? I am on the library waiting list for Baier’s book. I read Ike’s Bluff but did not care for it. Although I learned a lot from it, I thought the book was poorly organized (in fact, I had a hard time figuring out just how it was organized). But I will now read your review to see what I missed. It might be instructive for me to note that it was my 7th book on Ike, so by that time I had a pretty firm impression of his life. I’ll have to go back and think about how the book was organized, but I might have reacted differently to it if it had been my first or second book on Eisenhower (while I was still really figuring out his life). In addition, I don’t consider it adequate as an introductory biography per se, I really found it more an interesting “niche” read.